Sade Smith and Matthew Sanders are excited about their participation in the Washington Leadership Institute. Both Sadé Smith and Matthew Sanders became public defenders because they knew it was in the courtroom – fighting on behalf of people who are often marginalized and disempowered – where they could make the biggest difference. Now, they’re going to get the opportunity to take these values and aspirations to the next level. Smith and Sanders, both attorneys at the King County Department of Public Defense, were selected as two of 12 fellows for the 2017 Washington Leadership Institute (WLI), a program co-sponsored by the University of Washington School of Law and the Washington State Bar Association (WSBA). WLI recruits, trains and develops minority and traditionally underrepresented attorneys for future leadership positions in the Washington State Bar Association and other aspects of the legal community. The eight month program is followed by a community service project and one year of service with a WSBA program or committee – no small matter for Smith and Sanders, who already have heavy workloads. But they decided to become WLI fellows because they see it as a way to learn, grow, give back and perhaps become more influential in legal circles – a way, in other words, to do even more on behalf of their clients and colleagues. “There have been very special persons throughout my life at very perfect times, and I’d like to be in a position to give other people that same kind of encouragement,” she said. The program is for attorneys relatively new to the practice of law – people with three to 10 years of experience. It includes mentoring from well-known members of the bar, sessions led by some of the best local leaders, special trainings and one-on-one interactions with judges. 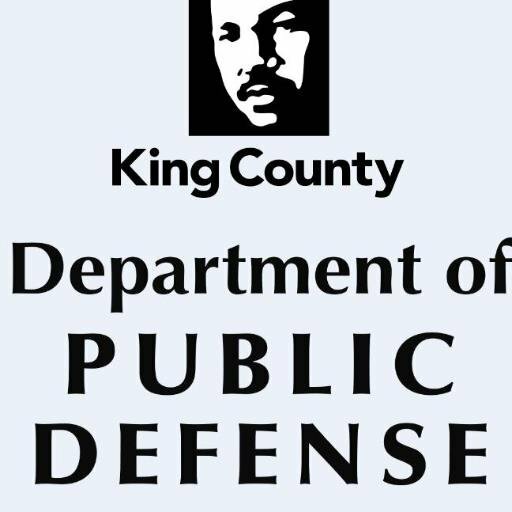 Several King County public defenders are past WLI fellows, including Dua Abudiab and Carlos Delos Reyes, who were in the 2016 program, and Twyla Carter, DPD’s misdemeanor practice director, Anita Khandelwal, DPD’s policy director, and Natasha Coleman, a public defender at the Associated Counsel for the Accused (ACA) Division. Sanders, a graduate of Seattle University School of Law, started working for the ACA Division in 2013. He’s in the felony unit, practicing primarily at the Maleng Regional Justice Center in Kent. Smith, who got her JD from the University of Illinois College of Law in Champaign, began working at DPD’s Northwest Defenders Division in 2014 after working as a public defender in Skagit County. She currently practices at Seattle Municipal Court. Lorinda Youngcourt, director of the Department of Public Defense, said she was proud of both Smith and Sanders, two attorneys who already bring a lot to public defense.